"Hattie is an orphan and has been shuffled around among relatives her whole life. She's tired of being Hattie Here-and-There. So when a letter comes from an uncle she never knew saying that he had left his claim in Montana to her, Hattie knows that it's fate calling and goes off to Montana to prove her claim. In order to prove the claim, she must finish the fencing and plow 40 acres of the land. It's a totally new kind of living for Hattie and much harder than she expects. Luckily, she makes some great friends... but tensions caused by the first World War are creating some problems for her German friends... Is Hattie strong enough to stand up for what she knows is right?" It's (and I mean this in a good way) Little House on the Prairie for a slightly older set. Hattie's struggles to survive are engrossing. She must work her own land, she must brave the harsh Montana winters, and she must navigate a rocky social landscape as her best new friends are being discriminated against because of the war. That was another thing I loved about this book. It depicts discrimination against German immigrants when the US was involved in WWI, which was something I'd never really thought about before. Big A little a, bookshelves of doom, and Little Willow have also reviewed it. Also, don't miss MotherReader's discussion on religion in the book. Just discovered your blog. Looks great! I just read Hattie Big Sky this past month and really enjoyed it. I could not believe how mature this sixteen year old girl was. If only I could have been like that at sixteen. I just found your blog after you left a comment on my new blog -- really like it. 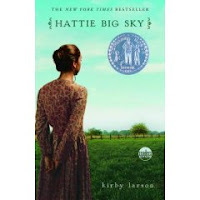 I loved Hattie Big Sky also -- amazing girl/woman! Maybe this could be part of the collection you're collecting for famous women's month -- Hattie might be fictional, but I bet it's safe to say that there were many women like her who helped pioneer our country. Good luck with your hunt for books on women. It looks like you're off to a great start!! Thanks for the link! Such a great story. I just loved this book..I wish she would write more.